Eagle Alpha, a research firm which mines insights from large datasets, launched a directory of alternative data providers. The firm will also hosting a seminar on building indicators derived from search data such as Google. The Dublin-based research firm now offers its alternative data directory to subscribers to help them identify useful sources for analysis. The directory currently profiles 150 alternative data providers with descriptions of the data along with information about the data’s sector and regional coverage and whether an API is available. 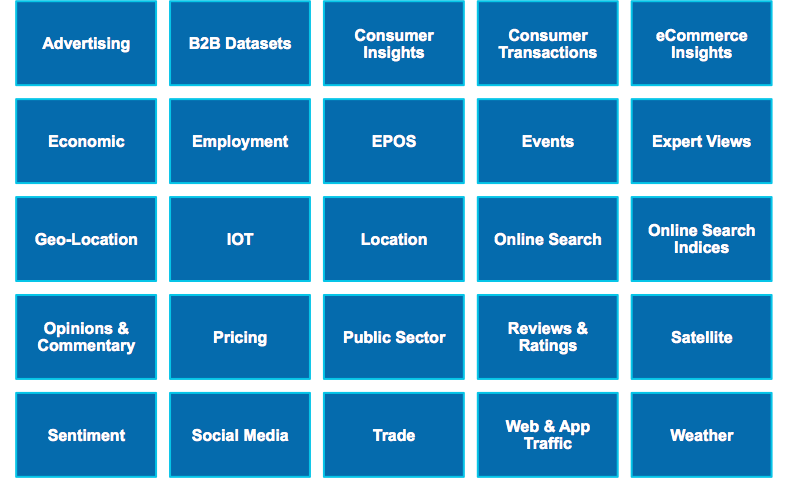 Data providers are classified under twenty-five categories of alternative data (below). Clients are able to access the datasets through Eagle Alpha if they choose. The search data seminar will be held in New York 7.45 am July 12th, location to be determined. The firm hosted a similar event in London earlier this month. Eagle Alpha was founded in 2012 by a former Morgan Stanley and Credit Suisse investment banker, Emmett Kilduff. The firm initially focused on deriving short term trading signals from social media, but altered its approach in June 2015 to focus on more fundamentally oriented investors. Its research product is similar to traditional research, but generated from non-traditional sources. The firm also offers analytic tools for mining alternative data, as well as access to data directly. After Eagle Alpha’s pivot a year ago, it increasingly targeted fundamental buy-side clients with research reports derived from analysis of alternative data. Nevertheless, the firm continues to offer datasets geared to more quantitatively oriented buy-side clients, and the new directory is potentially more useful to the quants.